Brookstone Manor is a 55+ community in Acworth, Georgia. Brookstone Manor is ideally located within the master-planned community of Brookstone Golf & Country Club. Active adults can enjoy private amenities and a socially fulfilled lifestyle as well as access to amenities at Brookstone Golf & Country Club. Homebuyers in Brookstone Manor can enjoy a low-maintenance home as well as a convenient location in Cobb County with easy access to Highway 41, I-75 and Kennesaw and Acworth. Residents of Brookstone Manor have access to a private clubhouse. Active adults can enjoy working out in comfort in the exercise room, socializing in the multi-purpose room or playing cards with a neighbor. There is also a catering kitchen that homeowners can utilize when preparing a snack for a party or event. The private outdoor amenities are sure to please active adults in Brookstone Manor. The spacious outdoor pool and patio area are great places to relax on your own or mingle with neighbors. Residents can also enjoy the great outdoors with strolls along Brookstone Manor's walking trails while appreciating the community s serene beauty. Homeowners also have access to the facilities at the Brookstone Golf & Country Club. They can purchase a membership to access these well-appointed amenities. The clubhouse, designed to resemble a Georgian country estate, features a fitness center with cardiovascular and weight-training equipment. The locker rooms have card tables so residents can play a quick game of poker before leaving the clubhouse. There are also meeting rooms, banquet facilities, and a formal dining room. A members-only bar and grill offers delicious meals where residents can grab a bite to eat while enjoying views of the golf course. Homeowners can also purchase the latest gear at the golf and tennis pro shop before a tournament. Brookstone Golf & Country Club s outdoor amenities are superb as well. The complex features an adult-only pool and a junior Olympic-sized pool, a beautiful patio, and eight lighted tennis courts. The 18-hole Larry Nelson golf course is sure to please golf lovers of all skill levels. Residents can also utilize the various golf practice facilities like a full driving range, putting green, and two chipping areas with a practice bunker. Construction in Brookstone Manor began in 2007 and will have 56 well-crafted attached homes upon completion. These residences feature ranch-style designs as well as brick and concrete siding exteriors. Some of the luxurious interior features include stainless steel appliances, gourmet kitchens, granite countertops, fireplaces, hardwood flooring, and sunrooms. Homebuyers can choose from four floor plans, which include the Howell, Kirby, Lassiter, and Harrison. These homes range from 1,605 to 1,930 square feet of living space and offer two or three bedrooms, two bathrooms, and an attached two-car garage. The Kirby and Harrison models feature a second-floor storage area that's convenient when extra space is required. Residents in Brookstone Manor can enjoy a low-maintenance lifestyle thanks to the homeowners association (HOA). The HOA fee takes care of landscape maintenance, exterior-home maintenance, streetlights, trash collection, and private amenities maintenance. Active adults can truly stay social and build friendships with other neighbors because they have more time to do fun things instead of yard work. Homeowners can join neighbors for happy hour, play some tennis or golf, participate in the community's ladies group or men's group, or attend club parties. Whatever activity residents decide to do, they have great options to keep their social calendar full. Brookstone Manor is located in Acworth near West Cobb, Georgia. 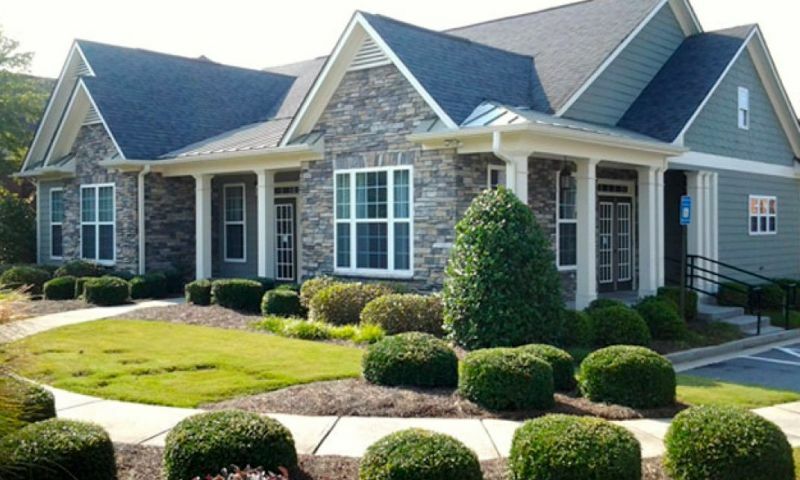 Residents 55+ have convenient access to Highway 41, I-75 and a short drive to Kennesaw. Brookstone Manor is also a short drive away from shopping options like The Avenue West Cobb and Town Center at Cobb. Other nearby attractions include Kennesaw Mountain National Battlefield Park, Lake Allatoona, and Kennworth Park. For farther travel, residents can visit Atlanta, which is about 30 miles away or board a flight at Atlanta's international airport. Brookstone Manor has plenty of amenities, attractions and maintenance-free homes that appeal to retirees and active adults in Cobb County, Georgia. Residents of Brookstone Manor have access to their own private amenities located at 1865 Manor View Circle. Brookstone Manor residents can purchase a membership to have access to all of the amenities at Brookstone Golf &amp; Country Club located at 5705 Brookstone Drive. There are plenty of activities available in Brookstone Manor. Here is a sample of some of the clubs, activities and classes offered here. Homebuyers in Brookstone Manor can choose from four distinct floor plans: Howell, Kirby, Lassiter, and Harrison. These attached homes range from 1,605 to 1,930 square feet and offer two or three bedrooms, two bathrooms, and an attached two-car garage. The Kirby and Harrison models feature a second-floor storage area thats convenient when extra space is required. Some of the luxurious interior features include stainless steel appliances, gourmet kitchens, granite countertops, fireplaces, hardwood flooring, and sunrooms. 55places.com is not affiliated with the developer(s) or homeowners association of Brookstone Manor. The information you submit is distributed to a 55places.com Partner Agent, who is a licensed real estate agent. The information regarding Brookstone Manor has not been verified or approved by the developer or homeowners association. Please verify all information prior to purchasing. 55places.com is not responsible for any errors regarding the information displayed on this website.